Receive 10% off of your pet’s dental cleaning in February! Every FEBRUARY is Dental Health Month at Heritage Veterinary Hospital. Your pet’s teeth are very important to their overall health. If we noted during your visit the need for your pet to have a dental cleaning and polishing then keep reading! 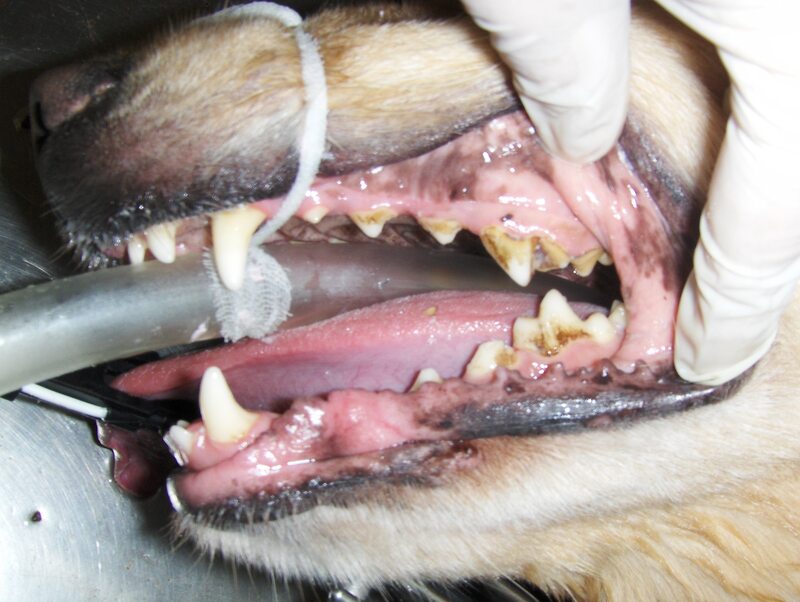 Dental disease is the most common disease in dogs and cats. Over 68% of all pets over the age of three have some form of periodontal or dental disease, making it by far the most common canine disease. *Pets need to have their teeth cleaned? Can’t I just brush his teeth? -Brushing your pet’s teeth is a great way to prevent dental disease. However, when a pet has signs of dental disease such as red or inflammed gums, bad breath, tartar, or even loose teeth, your pet needs a dental. *Yuck! My pet’s teeth look like the dog in the picture below, maybe even worse! What should I do? -No worries. 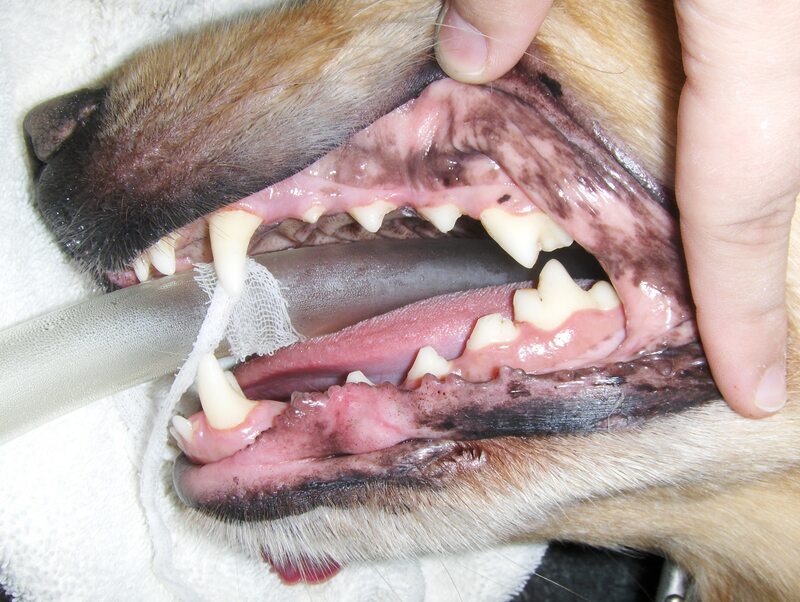 Your pet’s tartar can be removed with a professional scaling and polishing under anesthesia. Your pet’s teeth will then be polished and fluoride will be applied. Some pets may also need to have tooth extractions and/or antibiotics. *I have an older pet. Is it ok to have her under anesthesia? -Your pet will have an exam by one of our doctors prior to their dental. Your pet will also have blood work performed to check cell counts and internal organs. If any concerns are noted, one of the doctors will call you. Your pet will be monitored throughout the procedure and until he or she goes home. *My pet has a healthy smile again! Now what? -You will pick-up your pet in the afternoon and be greeted by your pet’s fresh breath! We will give you instructions on how to brush your pet’s teeth. Do not use human dentifrice or toothpaste. You can begin giving special canine toys as well as feeding the newer dental diets and dental treats to help reduce tartar build up. Please call us at 918-627-8575 to make an appointment. We perform dentals Monday-Friday mornings. Drop-offs start at 7:30a.m. We look forward to seeing you soon. P.S. Want more info? Visit our website at www.gtvets.com to see a short dental care video. 1- Keep pets current on vaccinations and medications. We recommended exams at least every 6 months but if you have concerns, please call immediately. 2- Have more playtime.Play fetch and tug of war more with your dogs or use a feather toy to play with your cats. 3- Keep a routine. For new puppies and dogs, take them out often. Teach them how to get into their kennel. Hang a bell on the door they go to go outside and teach them to ring it. Teach dogs to sit before you put food in their bowl. 4- Kick bad habits. If you dog begs for food while you eat, teach him to stay on his pillow or give him a toy or dog treat to eat. 5- Slim down your pet. Measure food out according to the weight recommended by the vet. Cut down on treats. 6- Teach a trick. Teach your pet to shake or sit and wait until you release them to get up. 7- Make a new friend. If your pet is friendly, schedule walks or dog park play dates with friends’ dogs. 8- Spend time outside. Take your dog for walks or let him play in the backyard more. 9- Reduce clutter. Throw away old, broken and worn out toys. 10- Give back. Consider fostering pets. Donating items to local shelters and rescue groups.